The Nigerian Healthcare Excellence Awards (NHEA) will be honour Prof. Fola Tayo and Prof. Auwal Abubakar with other healthcare professionals, facilities and stakeholders on Friday, June 22, 2018 at a grand ballroom event in Eko Hotel & Suites, Lagos. 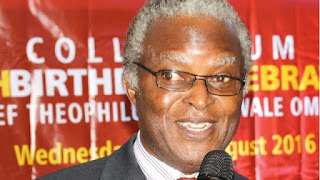 Prof. Tayo who is a seasoned pharmacist and General Secretary of the Nigerian Academy of Pharmacy will be honoured with the Lifetime Achievement Award. However, Prof. Abubakar who is the Chief Medical Director (CMD) of the Federal Medical Centre, Yola will be honoured with the Special Recognition Award for the Pauper Fund that provides medical assistance to the less privilege in the society. A statement signed by Moses Braimah, Director, Communication, Marketing & Strategy stated that the recognitions are being done after a rigorous selection process by the NHEA jury and voting by the public. According to Dr. Anthony Omolola, Chairman NHEA Advisory Board during a recent media briefing, “We used international recognised standards and criteria to evaluate our nominees before presenting them to the public to vote for anyone of their choice. Moreover, Omolola said that the two newly introduced categories are testaments of the determination of the organisers to continuously improve and expand the scope to accommodate more stakeholders who are making unique contributions to care giving in Nigeria. Safecare Facilities of the Year and Healthcare Media Excellence Award (Online) are two newly introduced categories. NHEA, is supported by PharmAccess Foundation and TStv. The award is organized by Global Health Project and Resources (GHPR) in collaboration with Anadach, USA.